Feeling inspired from our recent adventure with Korean BBQ, we decided to make one of our favorite traditional Korean noodles dish, japchae (Korean stir fried cellophane noodles). This is a great dish to serve a crowd and we brought this to an engagement party and it disappeared quick! We’re a big fan of Maangchi’s Korean Cooking blog and have cooked many of her recipes–they’re great! First boil the noodles until soft, test by sampling a single noodle. Drain noodles and place in large mixing bowl. The noodles are very long. Use scissors to cut the noodles into smaller pieces and set aside. Blanch the spinach. Remove and rinse well with cold water. Now remove all excess water from spinach by squeezing and wringing it, sorta like a wash cloth (don’t worry, it won’t rip apart). Cut into 2-3 in. pieces and add to mixing bowl. Stir fry carrots in a large wok or saute pan with a bit of olive oil. After a minute or so, add the onions. Cook until carrots are slightly tender but still have a little crunch and onions are opaque. Add to large mixing bowl. Using same wok/pan, add a bit more olive oil and saute garlic and then add the meat. Season with 1 tbs of soy sauce and 1 ts sugar. Half way through, add the well drained shitake mushrooms. When almost done, add the green onions and add to large mixing bowl. Now you’re finally ready to mix all this goodness together. Add about 2 tbs sugar, 1 ts black pepper, 2 tbs soy sauce, 2 tbs sesame oil and mix well. Taste and adjust with more soy sauce/sesame oil as needed. Finally toss in the roasted sesame seeds and enjoy! Um, yum! It doesn’t matter how late it is at night; looking at your pictures always gets me hungry. Delish! The japchae you made looks wonderful! I love your website! Thank you very much! I will post the photo on my website. Oh, I love Maangchi too! I’ve been wanting to make japchae for ages, but haven’t gotten around to it. Your photos are GORG! Your noodles look delicious! The colors just pop, especially against the dark background. Just one question: why not list at the beginning how many tablespoons of oil, soy sauce, sugar, etc. are to be used in the recipe, instead of putting it at the end? Thanks! wow the photos look fantastic! I love japchae. Ate a similar dish last night that I made from cellophane noodles, carrots, broccoli raabe, and roast chicken (leftover noodles basically), soy sauce and chicken broth. Nice because it’s not that high in calories and is gluten free. You have made a fantastic stir-fried noodles…and I enjoy your photographing very much. 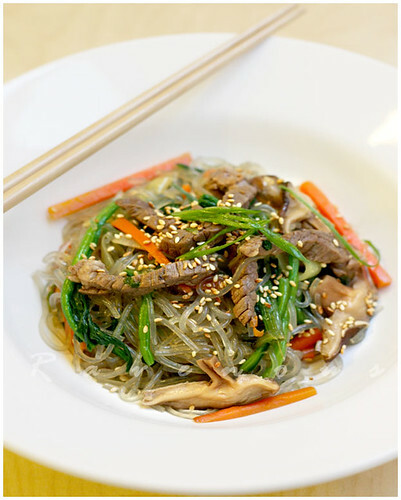 japchae is one of my favorite korean dishes. yours looks really good. LOL. Were you inspired to make this after watching a few Korean TV series? 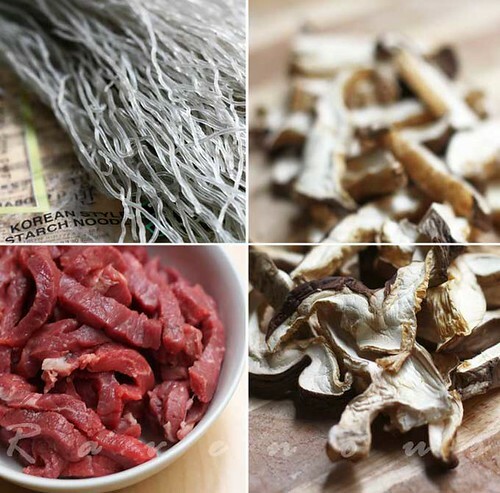 I like to put a dash of "nuoc mam" in my japchae. My Korean friends do not approve. Sorry everyone for the late reply…we've been busy…cooking! Elyse: Morning, noon, or night, we're always hungry for good food. Maangchi: Again, love your site and congrats to all your success. Gastronomer: It's never too late! MrsLuvenda: Thanks for stopping by our blog-hope you visit often! Ninnete: What you made sounds delicious–and inventive for using your leftovers! Angie: thanks and now you're officially on our blogroll! Sliceofsueshe: Thanks for visiting and hope you come by often! Nina: we don't watch those, but hear they're very addicting. Nuoc mam is good on almost everything! Wow. I just love your blog Thank you for posting all the wonderful recipe. Zoe: Thank you so much. 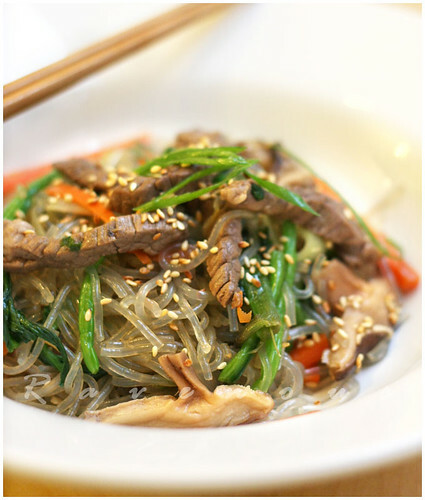 We hope you like Japchae and keep on giving us feedback! 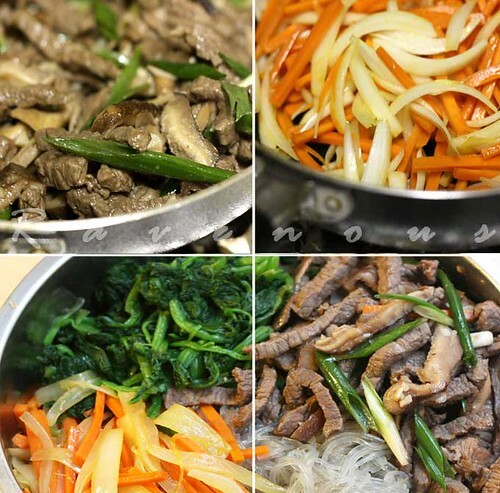 wendy: So glad our japchae recipe worked great for you! We usually make a lot and like black pepper, but when it comes to seasoning, always adjust according to your tastes. Thanks for sharing! Great blog guys! I just wish you guys write down what type of beef (round tip, shoulder, flank, etc) as I'm a newbie to cooking. Thanks for considering doing this in future posts. Fantastic site, fantastic recipes. One nitpick on this recipe: You don’t’ list spinach in the ingredients. thank you! you’re right, the spinach is in the dish, but not in the recipe, will edit that! I made this dish tonight and I think there might be a typo in the ingredients… 2 tbs ( tablespoonfuls) of black pepper seems to be A lot. Should it be teaspoon ?? ?